St. Patrick's Day Corned Beef & Cabbage | Let's Cook With Bry! 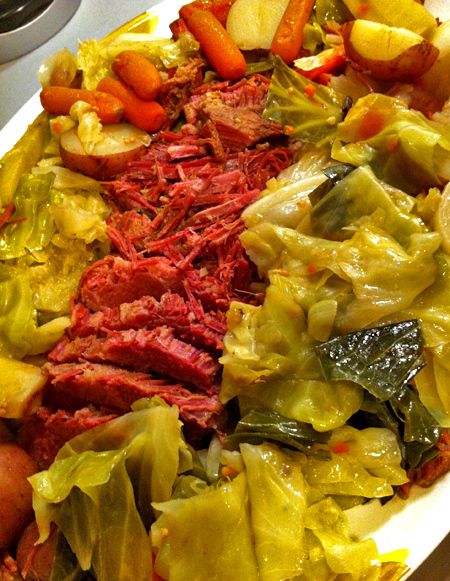 Like turkey on Thanksgiving, it’s the one day of the year when everyone gets to enjoy corned beef and cabbage. Some people refuse to eat it, claiming a dislike for the taste of boiled cabbage, but I found the solution to the REAL reason: I serve a couple of tablets of Beano to my dinner guests before indulging in this tasty meal! Another tip: the brisket will shrink to about half its size by the time it’s ready to be served, so plan accordingly. An uncooked 3-pound brisket may not be large enough to feed four hungry people, even with a plethora of vegetables. Wash the brisket. Make small X slits in the meat and insert the garlic and clove pieces. Place the meat into a large stock pot, and cover with water. Add the bay leaves, Old Bay, seasoning packet, peppercorns, 2 of the carrots, and the celery. Bring to a boil, skim off foam, and reduce heat. 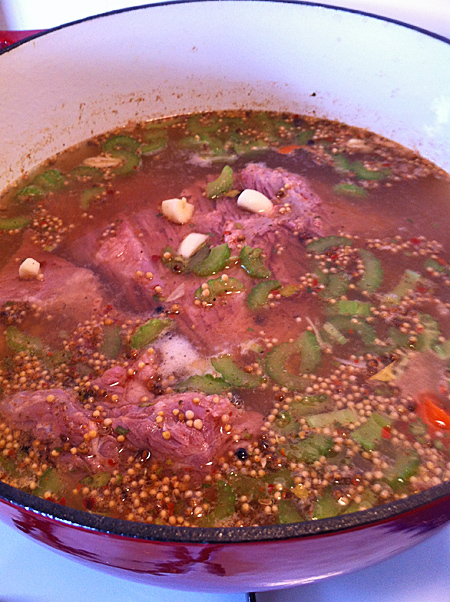 Simmer 2 – 3 hours, until the meat is nearly tender. Meanwhile, prepare the vegetables: section the cabbage into large chunks; peel and quarter the potatoes; peel the carrots and cut into 2-inch pieces; peel and quarter the turnips; and peel the parsnips and cut into large chunks. During the last hour, add the turnips, carrots, and parsnips. In the last half hour, add the potatoes and cabbage, and the ground pepper. Just before serving, remove the bay leaves and add the cider vinegar. To serve, slice the corned beef across the grain into thick slabs, and present on a platter surrounded by the vegetables.